Looking back, I can see how the threads of my life braided together into 3 C's - Creativity, Communication and Compassion. As a child I was a constant reader, loved to write and created art in many mediums. I studied ballet, took singing lessons, auditioned for the theatre. I wanted to engage in all forms of communication - reading, writing, speaking, listening, singing and acting. In college, at Arizona State University, I majored in English, published articles in journals and earned 4 degrees including my PhD. I also taught composition and helped my students find their own voices through writing. When I left academics, I became an investment advisor and found my partner in work and life, Dan Selak. We married and blended our families, including 6 teenagers, and moved to San Juan Island, WA in the Pacific Northwest. 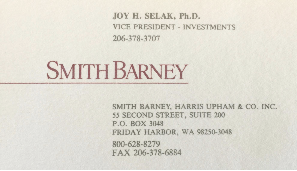 There we were the proud founders of the San Juan Island Community Foundation. My career as an investment advisor ended when I became ill, but the quiet time that followed took me back to writing. I began with CeeGee's Gift, a one-act play that won the San Juan Islands Playwrights' Festival in 1992 and was produced for the stage. Years later, as a novel, the manuscript won competitions through the Writer's League of Texas. My physician and I also wrote the book You Don't LOOK Sick! Living Well with Invisible Chronic Illness, now in its 2nd edition. This led to years of speaking, publishing articles and giving interviews as we worked to lift hope for others struggling to build lives that include long-term illness. As my health improved, I served as a nonprofit volunteer, founder, strategist and fundraiser. I learned to organize for effective giving and attract others to a meaningful cause. In 2004, I joined the board of Austin's ZACH Theatre and served as President during the building of our new theatre. In 2016, I became a Chartered Advisor in Philanthropy®. Now, working with Rodman & Associates, I use effective communication to increase support for meaningful causes.